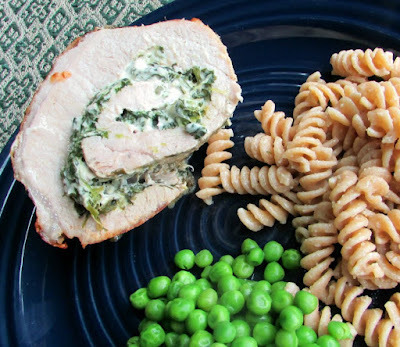 Luscious pork loin wrapped around a filling of Parmesan cheese and spinach. It looks more complicated than it is and is a dinner worthy of company! I don't know why, but pork just says fall to me. There is something about it that seems perfect when the weather turns a little cooler. I have had this idea in my head for a little while now, but it had been so hot that the timing didn't seem right. It finally cooled down, so I threw open the windows and got out a big hunk of pork loin! This filling is delicious! I knew it was going to be. How could cream cheese, Parmesan and spinach not be good together? Plus it smells amazing while it is cooking! Of course everything is better browned, so the pork took a turn on the hot stove before going into the oven. It came out with a beautiful color and a knock your socks of smell. As with any meat, you are going to want to let this rest a while before you cut into it. It is especially important with this though because you don't want all that melty cheese running out. Give everything a chance to settle in for a bit before you dive in! I served this with some simple butter parmesan noodles and some peas. It was an easy meal that looked like it took a lot more effort than it did. It was greeted by a lot of mmmms at the table. That is a win in my book! If you are a fan of pork recipes like we are, I have plenty more ideas for you! Apple cider pulled pork is a fun spin on a favorite and it comes together easily in the slow cooker. Brown sugar Dijon pork roast cooks along with veggies on a sheet pan for an easy one pan supper. Or if you like the idea of stuffed pork loin, this apple stuffed pork loin is a fall favorite! Cut pork loin almost in half, leaving about 1/4" remaining intact. Lay the pork loin open. Starting from the center, cut each side almost in half again. It is easier than it sounds, just use a sharp knife and go slow. Open the pork loin up and pound out any high spots. Squeeze the liquid out of the thawed spinach. Mix it with cream cheese, garlic, green onions, Parmesan and pepper. 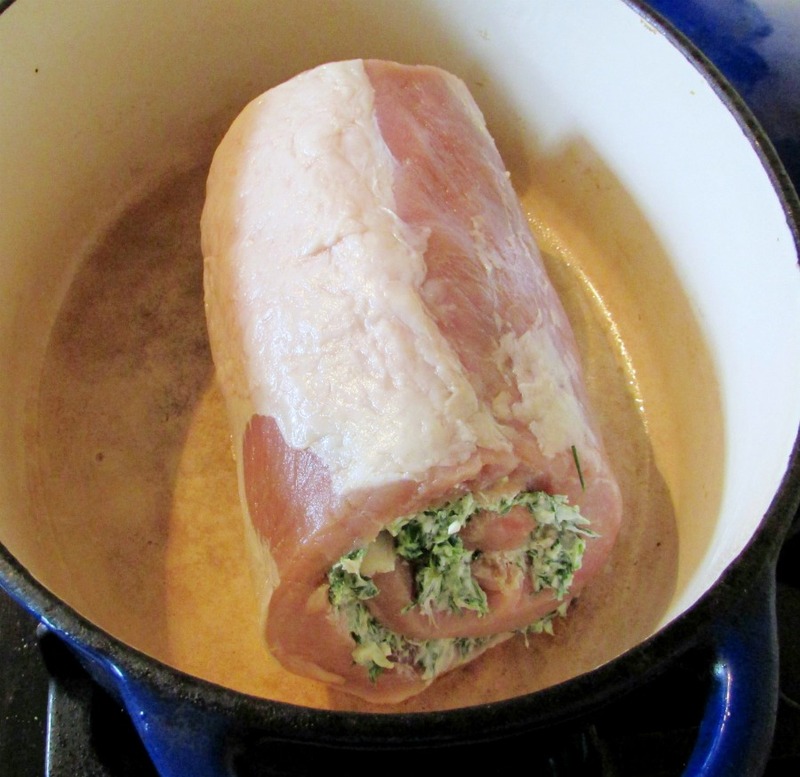 Roll the pork loin tightly. 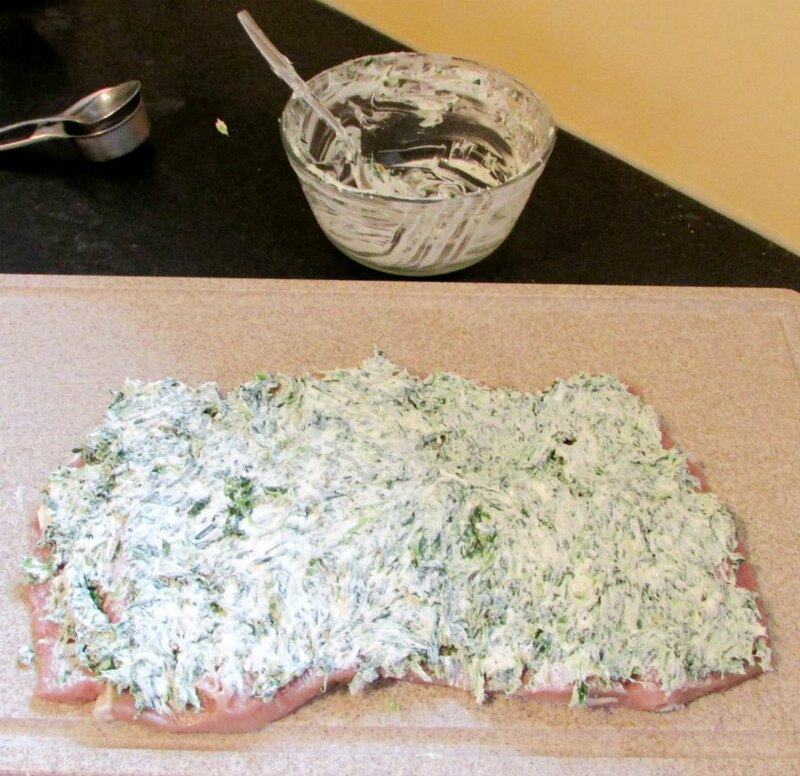 Sprinkle with salt and pepper on pork loin, then brown on both sides. Cover and place in 375 F for about an hour or until it reaches an internal temperature of 145 F.
Let rest for at least 10 minutes and then slice. It smells so good it will be hard to wait, but it is worth it! My husband loves pork loin. I'll be sharing this with him! Thank you for posting! We didn't used to eat much pork loin, now it is one of my favorite things to make! Wow Carleee! This sure gave me happy goosebumps! And loove the presentation as well! You are certainly very talented! Thank you so much! Ever since I figured out stuffing a pork loin like this is a lot simpler that it looks, we have been having fun trying new stuffing flavors. This one was a definite hit! It is a lot of fun to make and looks really fancy when you serve it! You really should try it soon! Oh so pretty - and yummy! 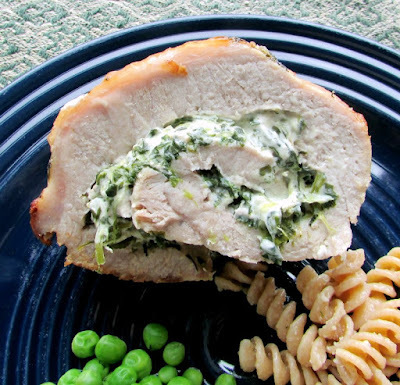 I just love stuffed pork loins. They are easy to make but make a big impact when serving them! That's a win in my book too. This looks delectable. We love pork around here, and this recipe is sure to be one of our favorites. Can't wait to try! This looks and sounds delicious. As you say, can hardly do wrong with the filling mixture! Thank you! I really think you could put creamy melted cheese on just about anything and I'd eat it! Stuffed pork loin is delic!! Thanks for joining in this month! We have been having fun trying all sorts of different fillings! Thanks for picking a great theme! Yum! This roll looks beautiful! I love a spinach cheese filling. It sounds perfect. This is my favorite cut of meat!! Your recipe looks amazing Carlee! Thanks for sharing! Thank you so much Elaine. I have been having a lot of fun experimenting with pork loins lately! This will definitely be on the menu Carlee! 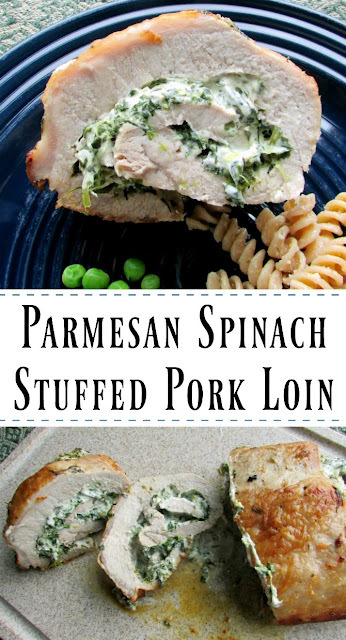 We love pork and also spinach. This recipe looks good enough for a special occasion meal as well. Thanks for linking up and sharing with us at #WednesdaysWisdom. Have a great week! I definitely think this would be perfect for a special occasion meal. It is just all the much better that it is pretty easy to prepare! Thanks so much for hosting! Gorgeous, Carlee! Love that shot with the swirl of filling all surrounded by luscious pork! Thank you! I just love wrapping the pork around tasty fillings! This looks great Carlee! I always end up with dry pork loin, even if I cook it the right amount of time. The stuffing inside this recipe looks like the perfect fix to keep the inside nice and moist. Thanks for sharing at Inspiration Thursday! Have a great weekend. Pork loin can definitely get dry easily. This one was definitely full of moisture and flavor. I always start set my timer for 5-10 minutes less than the recipe says to get a read on the temperature at that point and judge how much more time to add from there. The cream cheese definitely helps keep everything moist and flavorful just in case! I absolutely have to try this. What a great presentation! Thank you! Ever since I learned how easy it is to cut and roll a pork loin like this, I can't be stopped. There are so many fun flavor combinations to put in there! What a delicious Stuffed Pork Loin that we will really enjoy! Hope you are having a great weekend and thanks so much for sharing with Full Plate Thursday. Thanks you! We really enjoy it too. Thanks for hosting. Sounds perfect for a dinner party! Thank you Carlee for sharing another delicious recipes with us at #AnythingGoes and see you next week. It would be great for guests! Thank you! It is really very good! Thanks so much for hosting! We have stuffed it with apples before and caramelized onions and really liked it, but there is nothing quite like stuffing meat with cheese! Thanks for hosting! Looks so tasty - Thanks for linking up to Pin Worthy Wednesday, I have pinned your post to the Pin Worthy Wednesday Pinterest Board. Thanks for stopping by, this is a good one for sure! Love to find new recipes for pork loin. Think I will need to join the Foodie Extravaganza group. Pinned! Thanks for sharing with us at #Throwback Thursday link party. Please join us again next week and invite your friends to join. 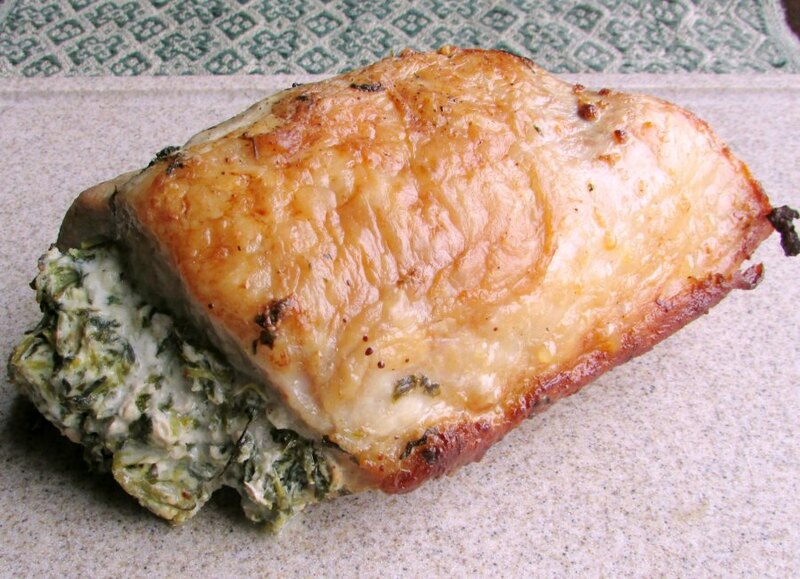 I have been loving pork loin lately, of course wrapped in bacon or stuffed with delicious fillings it is hard to go wrong! Thanks so much for hosting! 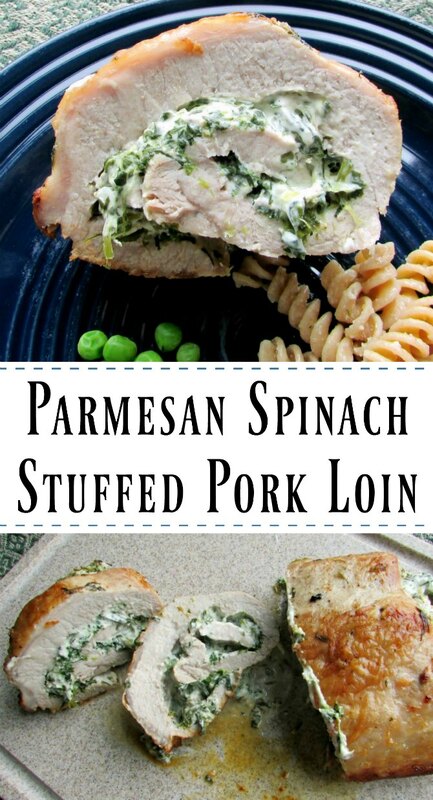 This looks fantastic- I've never actually made a meat dish that's stuffed (I'm almost ashamed to say that! ).You make it look so easy! I hadn't done much meat stuffing myself until earlier this year, now you can't stop me! I hope you love it! Holy Moly I'm making this for sure! This sounds so completely amazing! I need it in my life and my family will love it too! Can't. Get. Enough. Stuffed. Pork. Or not stuffed. I just love pork. This looks delicious. Thanks for sharing at #SaucySaturdays. I love pork too, especially in the fall! Thank you so much for stopping by! Pinned and Tweeted. These flavors all sound great together. I love the idea of adding the mixture to the pork loin. Thanks for sharing at Snickerdoodle Sunday. Thanks so much! We really enjoyed it. Thanks for hosting! With little guys running around, it is about the only way to cook! I have been looking for some pork recipes. This looks delicious! Pinned! Looks delicious and easy to make. Pinned to share. Thanks, Joy! It is definitely both! Found your recipe on Pinterest and making it right now...it smells amazing in my kitchen! Can't wait!